This cookie recipe is very versitile, At The Bake Krazy Bake Shop this is the recipe I used to make my tarts with. Its also works great in a cookie press. 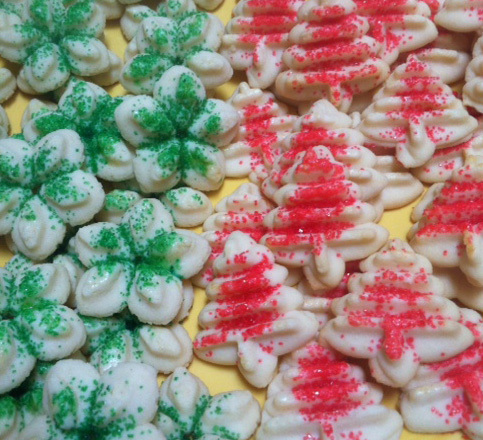 The photos you see to the right were made using a Wilton Cookie press. In a stand mixer with the paddle attachment mix both flours, salt and sugar at low speed for approximately 30 seconds. Add the butter and continue to mix at low to medium speed for about 2 – 3 minutes. Add the egg and egg yolk and continue to mix another 2 – 3 minutes. Check the dough by pinching it together, if it fails to hold add another egg yolk. Pull the dough from the bowl and if your not making the cookies (or even a tart shell) place the dough in some plastic wrap and store in the refrigerator. Remember that there is a high content of butter in this recipe and it should be used cold. If you have not used a cookie press before it could look a bit perplexing. To set it up place one of the disks into the press, then load the cylinder with the cookie dough. Screw on the handle and your ready to go. Here is the trick, hold the end of the press firmly over a sheet pan and press down on the trigger as far as it will go, Lift up on the press and continue to press more cookies onto the sheet pan. (No oil is needed on the pan because of the high butter content) Remember to keep consistency press and trigger the same each time. It is alway best to refrigerate the cookie sheet pan with the cookie dough for 30 minutes before baking, however if your dough is cold and the sheet pans are cold at application they can be placed directly into the oven. Bake at 350 degrees for approximately 12 minutes or until there is a slight tint of browing on the edges. Once baked allow the cookies to cool until set. Store tightly in a sealed airtight container.